Stop What You're Doing and Write! Yes, You; Write! Most writing guides imply--or outright state--that there's a fixed, specific formula or list of rules you must follow to achieve writing and publishing success. And all of them are phonies. Well, not completely. There are real, applicable techniques and strategies in any writing reference to help you. But the idea that there's only one way of writing? Nuts! 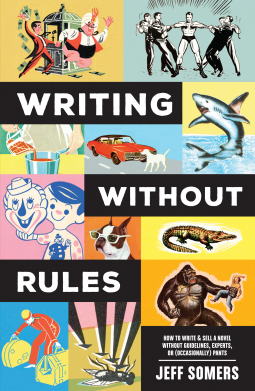 With unconventional approaches to the craft, fresh angles on novel writing and selling, a healthy dose of humor, and no promise of refunds, Writing Without Rules is for those writers who have tried and tried again--and are ready to success on their own terms. In these pages, accomplished author Jeff Somers will show you:The key to a successful writing career is doing the actual writing, no matter the circumstances.Fantastic ideas are available everywhere--you just need to know how to tap into sources through a variety of approaches.Important craft aspects that you should focus on, such as characters and dialogue, while spending less time on others, like setting.Effective ways to get published--whether it's traditional or self-publishing--and how to supplement your income.Whether you're a plotter, a pantser, or somewhere in-between, Writing Without Rules is for those writers who are looking for a fresh take on tackling the challenge of writing and selling a novel, and building a career. As Somers will show you, it's less about being perfect in everything, and more about having the confidence to complete everything. I've read a few writing guides over the years, and generally they've left me underwhelmed (because they were full of things I'd already worked out for myself) or anxious (because all the things set forward as 'rules' are the antithesis to my own style of working). Jeff Somer's Writing Without Rules is therefore a breath of fresh air in an oft-stagnant pool. Rather than outlining firm dos and don'ts, Somers present a variety of options to suit any writing style, with emphasis on everyone finding their own way of working. Along the way, he shares amusing anecdotes on his own writing journey and hilarious footnotes that are well worth reading alongside the main text. If you are a budding author and only plan to read one writing guide, make it this one. It offers some wonderful tips and nuggets of advice without preaching a particular path, and by the time I put it down, I was bursting with enthusiasm and ideas for current and future projects. I think every author should pick up a copy of this book. It will spark your creativity as well as giving you a good laugh.